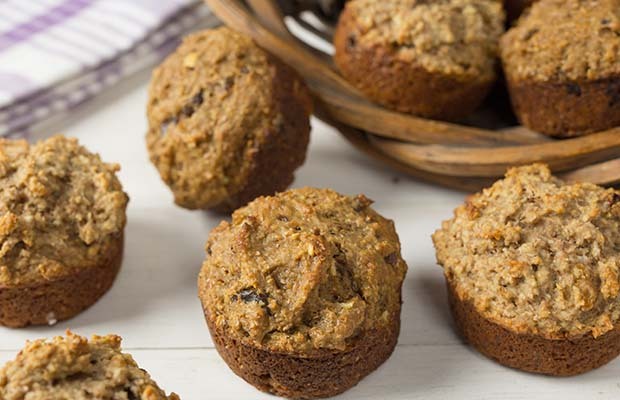 These tasty Apple Bran Muffins are a delicious source of fiber! In a large bowl whisk together buttermilk, brown sugar, canola oil, molasses and egg. In another bowl, combine bran, all-purpose flour, flaxseed, baking soda, baking powder and salt. Stir dry ingredient mixture into liquid ingredient mixture. Stir in apple and dates. Spray muffin tins with a nonstick cooking spray. Spoon batter into muffin tins two thirds full. Bake 17 minutes or until wooden pick inserted in centre comes out clean. Remove from oven and cool 5 minutes. Remove muffins from tins and cool on a rack. Serving Size: 1 muffin. Each muffin contains 2 tsp (10 mL) ground flax.